Samsung Galaxy Tab S4 is an outstanding mobile device, by all means, said and done. 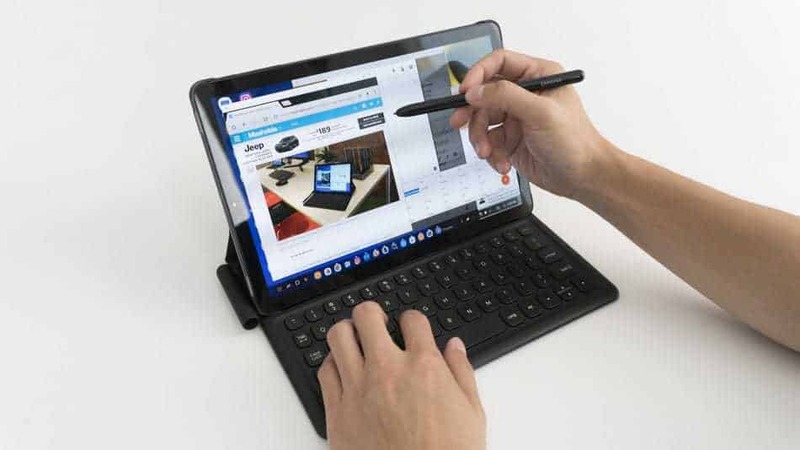 In fact, if you’re looking for an Android tablet that has authentic 2-in-1 features that can effectively deliver laptop-like and tablet mobility then this is it. 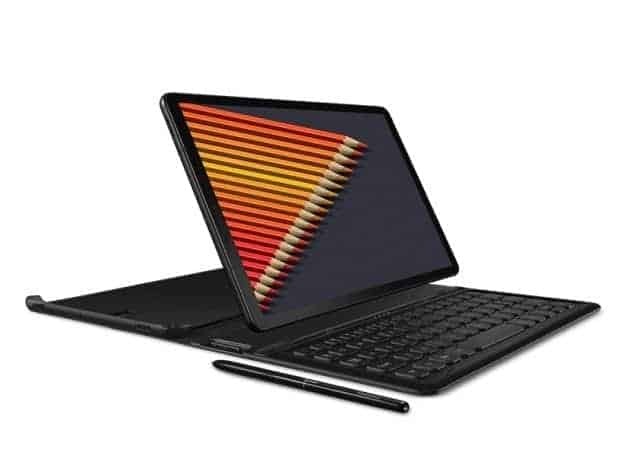 There’s literally no other device of this kind that does it better than the Tab S4. Sadly though, as much as we hate to say this. While it was meant to come and compete with the productivity of what the best of Apple has to offer in the iPad realm, they fell short. They just did not get the job done in this sector. Worse still they came out costing just as much. Aside from all that, there’s one new thing in particular that has tickled most people’s interest. Their awesome built-in Dex software. It has second-screen capability alongside having the ability to mimic desktop interfaces. They’ve done away with the idea of having to have additional bulky hardware whenever you want to switch to the laptop-like mode. This complete with a system tray, taskbar and re-sizable windows. This Dex software feels the answer to the 2-in-1 progress Android has needed for a very long time. However, we can’t help but notice it kind of still feels like a work in progress when compared to the likes of Chromebook and Windows laptops. The User Interface could have been a little more touch-friendly and it lacks a trackpad which is usually located on the optional keyboard cover. This can prove to be a bit of a problem. There’s a lot to like about the Galaxy Tab S4. Unfortunately, the design and overall build aren’t one of those very many things. They could’ve certainly done much better. It’s giving many people a lot of split feelings. The tablet’s front looks relatively modern and sleek, with bezels that are significantly smaller than what the Galaxy Tab 3 has. The fingerprint reader and home button removal are what this has resulted in. It has actually reduced functionality, however, it looks so much better. Iris and face scanning functionality has replaced the fingerprint reader. This means that you still have a secure and fast way to unlock the device. The previous Galaxy Tabs oblong fingerprint reader made the tablet look a little outdated as well as cheap. The new bezel design that’s much slimmer has made room for a larger Super AMOLED 10.5-inch display screen that looks wonderful. Good displays are something Samsung knows how to make very well, and they always have. They definitely did not skimp out when it came to the Galaxy Tab S4 screen as well. The screen’s resolution is 2560×1600 which works well for almost every situation. Although, as the front of the tablet looks as modern and as sleek as ever, unfortunately, the back looks like something out of a 2012 device. Samsung has insisted on keeping with their old and boxy design. Most people in this day and age aren’t too fond of it. We aren’t either. The fact that they changed the camera’s shape may give it that little aura of modernity, however, they stuck to their guns concerning form factor. On its sides, you’ll find quad stereo speakers, headphone jack and a type-C USB port. The speakers are supported by Dolby Atmos and tuned by AKG. This has resulted in some pretty awesome sound quality. Watching movies and listening to your favorite tunes using the tab is a blast. The volume keys and power buttons are located on the right side. Samsung Galaxy Tab S4 uses Snapdragon835 SoC alongside 4GB of RAM. This handles tablet daily usage very well. You certainly won’t notice any severe stutters or hiccups at first glance. You’ll find cameras at the back as well as at the front of the mobile device. The back having a resolution of 13MP while the front has a resolution of 8MP. Both the image quality they produce is average, to say the least, Nothing too exceptional. But anyway, the Samsung Tabs have never really been known to have exceptional camera quality. However, they surprisingly shine during video calls. It has a 7300mAh battery inside, which happens to be a considerably large upgrade from the 6000mAh battery that’s inside the Galaxy Tab S3. It should be able to last you about thirty-six hours or so on one full charge. This is certainly a very big plus considering the fact that Samsung was specifically marketing this product to the productivity-focused consumer. It offers 64GB storage alongside 256GB variants. Okay, 64GB does seem a bit small, especially when you consider the fact that it’s meant to act as a laptop replacement. But, don’t fret too much just yet. They do have a 128GB option on offer. There’s something new that Samsung has brought to the world in this department. It’s called Dex software. It’s actually got a lot of people excited, including us. 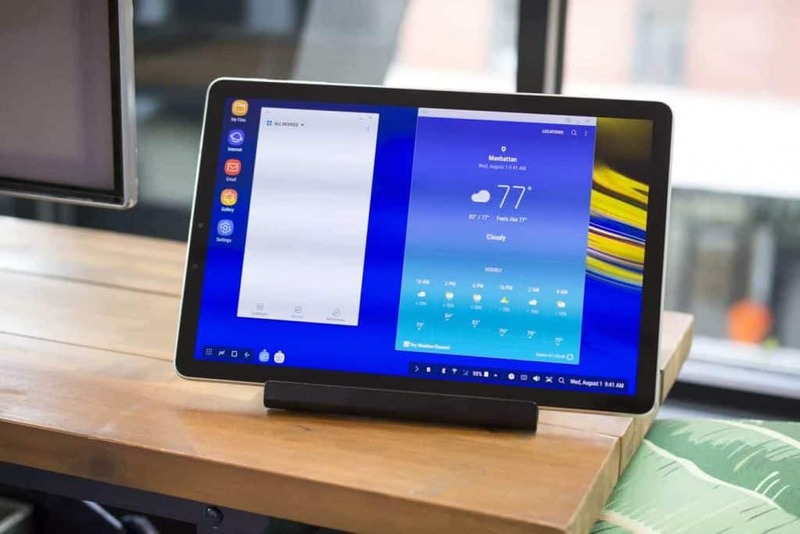 Originally designed and manufactured to harness the power of the phone hardware from Samsung encouraging desktop-like experiences accompanied by external monitor connection. 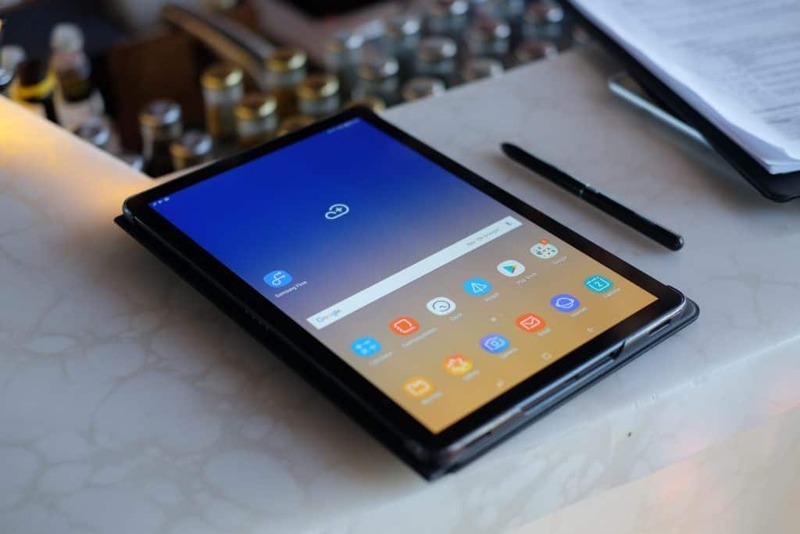 They’ve decided to employ this new software onto their Galaxy Tab S4 tablet. Honestly speaking, this new Dex software looks really awesome. It has a traditional Windows PC format look-alike, which means that a lot of you will probably feel very comfortable using it. Dex software still has to run Android applications because the Galaxy Tab 4S is still very much an Android tablet device. Okay, this tab won’t really replace your laptop, but it comes pretty close. A lot of this is because of their new Dex software. It’s simply outstanding. However, we can’t help but feel there’s a lot more work that can be put in to make it better. It can get a bit frustrating at times. The keyboard doesn’t come with the package but as you use the tab you realize how necessary it is. All in all, we think it’s a good product from Samsung and definitely worth the buy. The Samsung Galaxy Tab S4 is a great bit of kit, just like the majority of technology Samsung release it's very well built, up to date hardware and some great software too. However the laptop is let down by a few cons, which can be easily resolved, thing such as more RAM would be beneficial, the DEX mode has some annoying bugs. Check out our full review for more information.